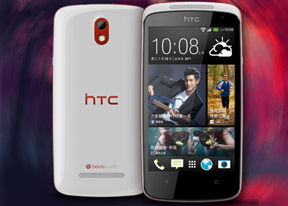 The HTC Desire 500 is built around a 4.3" capacitive touchscreen of display of WVGA resolution (800 x 480 pixels). The pixel density clocks in at around 217 ppi, which is acceptable for a midranger. Of course, there are more than a couple of 720p screens in the midrange already, but the Desire 500 has to make do with lower than HD resolution. Resolution aside, the Desire 500's display has great viewing angles with only minor contrast fading when viewed from an angle, and reasonably good colors, as well. Indeed, colors are a tad washed out and not as saturated as the ones on the HTC One mini, for instance, but on their own, they look just fine. The white balance on the Desire 500 mini is a bit too cold (bluish) to our taste, while the contrast isn't anything to write home about either. 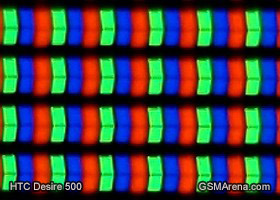 The display matrix is a standard RGB row, which we've taken a closer look at using our digital microscope. When it comes to sunlight legibility, the Desire 500 comes in slightly above average. While not as good as some of the premium offerings, the screen will still be visible in moderately bright environments. As for battery life, HTC claims the Desire 500 will be good for up to 435 hours of 3G stand-by time and just over 12h hours of 3G talk. 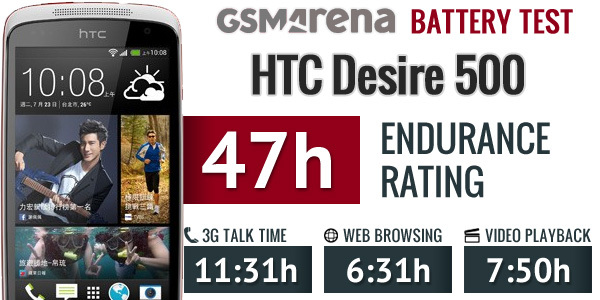 In our own battery test, the Desire 500 managed to achieve an overall endurance rating of the respectable 47 hours with 3G talk times coming in very close to the numbers provided by HTC. An endurance rating of 47h means that you'll be able to go for almost two days while performing an hour each of talking, browsing and watching videos before requiring a charge. For the full battery test breakdown, check out this post.